The touch-style U.are.U 5160 Fingerprint Reader is a PIV-certified, optical fingerprint sensor designed to serve as a USB peripheral. With a contemporary design, compact size and unsurpassed performance, the 5160 is the natural choice for those who want and need the very best. PIV certifiedCertified to meet and exceed the FIPS 201 Personal Identity Verification (PIV) Image Quality Specification. The U.are.U 5160 produces 500dpi and 1000dpi fingerprint images in ANSI and ISO/IEC standard formats. Compact sizeOne of the most compact standards-compliant optical fingerprint sensors on the market, measuring only 72mm (L) x 39mm (W) x 21.7mm (H). status LEDsErgonomic blue “landing lights” help guide the user for simple, accurate fingerprint scans; applications can also use red and green status lights built into the sensor itself to provide immediate feedback without the need for a separate display screen. High durabilityBuilt for use in demanding environments, the optical-technology U.are.U 5160 has a hard glass imaging surface, and an IP64 rating. 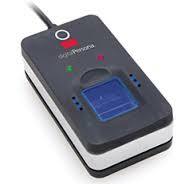 High-volume manufacturing Whether you need just a few fingerprint readers or many tens of thousands per month, DigitalPersona’s reliable, world-class manufacturing can satisfy high-volume requirements.